For complete non-swimmers, to children able to swim unaided and learning freestyle and basic backstroke. Private learn-to-swim classes encourage independence in the water whilst ensuring kids are developing a love of swimming and the aquatic environment. Our swimming instructors use toys and aids such as noodles and kickboards to assist kids in gaining skills in swimming strokes. We incorporate swimming games and songs where suitable into classes. 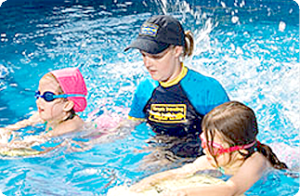 We also specialise in working with children who are fearful in developing their comfort and confidence in the water. 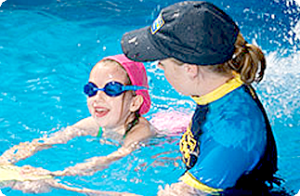 All activities teach children swimming skills and help establish correct swimming motor patterns. Every class is tailored to the individual needs of each child. The lesson structure is your choice and may involve the child spending one on one time with the instructor – we usually recommend between 15-30 minutes per child with their teacher. You may also include up to 4 children in a 30 minute class and split the cost of the lesson, however, we do find the more time each child has with an instructor, the more quickly they progress.